St Martin's is a co-educational school from Grade 000-Grade12. Boarding is offered in the high school. In our play-rich Grade 000-0 environment, children are encouraged to use their senses to discover new things and learn many lessons that they will need before formal education begins in Grade 1. 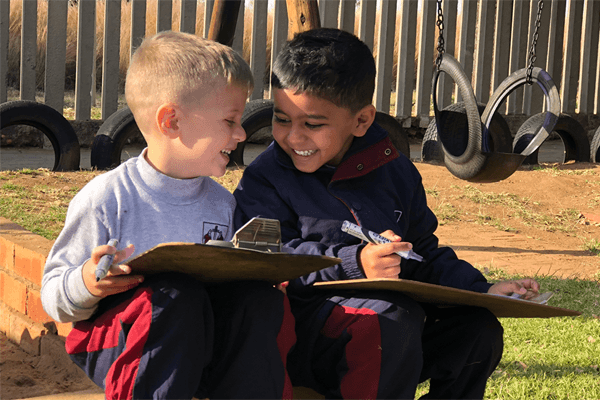 The junior phase, Grade 1-3, strives to cater for the needs of all children by encouraging them to develop confidence and become well-balanced individuals. At this stage, learning styles are developed so the pupils are afforded the opportunity to explore their full potential. In the senior phase, Grade 4-7, parents who recognise the value of an integrated education will appreciate the school’s progressive child-centred approach. The modern dedicated music and art centre, science laboratory, the library, and the computer centre are intensively used. Finally, in the High School, the favourable staff-to-student ratio and the tradition of Houses assures parents of an intensive level of teaching, supervision and pastoral care. Students are expected to take increasing responsibility as they progress through the school. There are opportunities for service and leadership within the house, monitor, and prefect system. Boarding is offered from the Grade 8 year. Comfortable accommodation in modern, small dormitories and individual study-bedrooms is available to girls and boys. Weekly boarding is permitted. The dedicated resident staff offer a “home-from-home” atmosphere and they provide guidance and support in a structured environment.